On Thursday 30th June Osman Gazi Bridge the biggest section of the Gebze-Orhangazi-İzmir Highway Project, and the world’s fourth longest suspension bridge with the largest central span, was opened to traffic with a ceremony attended by Turkey’s President Recep Tayyip Erdoğan and Prime Minister Binali Yıldırım. During the opening ceremony, President Erdoğan announced the valuable news, stating that the bridge will be free to use until the end of Eid al-Fitr. Achieved across a 39 month period, the Osman Gazi Bridge aims a reduction the over clustering of industrial operations in Kocaeli’s Gebze and Dilovası districts. “Journey time between Istanbul and Izmir will lessen to three hours 30 minutes ( from nine hours) ” Erdoğan said, adding that the whole motorway project is scheduled to be finished in 2018. The president made these statements whilst talking at the ceremony when the last bridge deck for the Osman Gazi Bridge was installed in late April. At the same ceremony President Erdoğan said that the new bridge, which connects both sides of the İzmit Bay in northwestern Turkey, will be named after the founder of the Ottoman Empire, Osman Gazi. 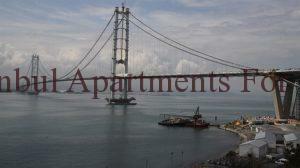 Hense, the bridge has two names, the other name being İzmit Bay Bridge. “It will be amid the first completed ones of Turkey’s 2023 (vision) projects,” Erdoğan further added. The whole project’s worth is estimated at $9 billion. Numerous other mega projects, including Istanbul’s third airport, are expected to commit the country’s 2023 vision, a set of goals to be attained by Turkey for its centennial celebrations. According to the World Bank’s Private Participation in Infrastructure Database (PPI Project Database) published in June, Turkey’s seven infrastructure projects, which total to $44.7 billion, make up 40 percent of world investments in 2015. In this awe, the Gebze-İzmir Motorway investment of $6.4 billion plus Istanbul’s IGA Airport at $35.6 billion significantly contributed to Turkey’s acheivements. Earlier, whilst talking about the mega project, Dilovası District Governor Harun Şahin said the bridge was amongst Turkey’s huge projects and worldwide projects as well, and they would host a bridge that would go down in world history. Stressing the bridge’s positive effects on the region, Şahin pointed out that housing and land prices had increased in Dilovası, which has the best view of the bridge. Şahin said a large number of people would enter into the region, and new shopping malls were being built next to the bridge with a volume to employ about 1,000 personnel, this will offer employment to the region’s local neighborhoods. Saying that there were five industrial zones in Dilovası, and 20 in the area including Tuzla and Gebze, Şahin noted that Gebze and Dilovası were industrially saturated, and industrial zone prices were too high in those regions, causing industrialists to have serious problems. The 433-kilometer-long motorway in the project is expected to offer a direct linking connection from Istanbul and its surrounding regions to the third and fourth biggest cities in Turkey, Izmir and Bursa. The motorway crosses through the bridge in the İzmit province, southeast of Istanbul. The project began with an interchange (2×5 lanes) that was built 2.5 kilometers after the Gebze Interchange on the Anadolu Highway, and ended at the Otogar Intersection on the İzmir Highway. The bridge hit a height of 252 meters and the bridge deck is 25.93 meters long, with a main span length of 1,550 meters. 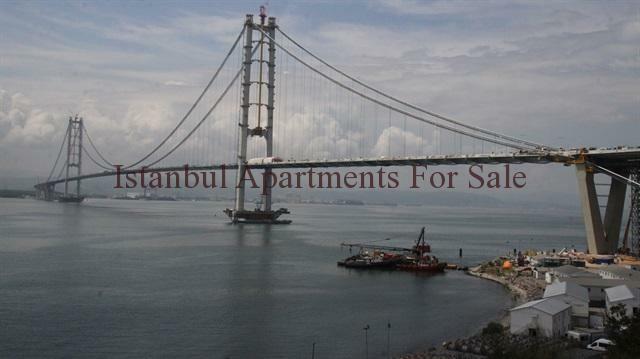 Totaling 2,682 meters, the İzmit Bay Bridge has the fourth largest main span in the world. The installment of the bridge was finished at the end of April and the bridge is now opened to traffic today, following isolation and asphalt application.